If you’re contemplating cutting back on your child’s free playtime indoors or outside because of your concerns about safety or because of scheduling purposes, think again. As an adult, it might not look like it’s a top priority that your child is finding time for playtime. But it’s actually an important time of the day for them — it helps them develop and learn. And if you’re worried because your child seems to play near other kids but not necessarily with them, don’t fret. That’s a total normal stage of development. Keep reading to learn why play is important, how it can benefit your child, the different types of play your child needs, and more information that will help you ensure your child gets all the play time they need. Kids’ lives are overscheduled now more than ever before and all those activities are taking a bite out of their free playtime. Even for young kids, parents schedule structured activities, like sports and lessons meant to give their child an early leg up when it comes to the competition they’ll face later as they reach school age. And once kids reach school, they’ll have even less free time. Kids are expected to learn more and at a faster rate than even before. Additional requirements from schools to increase their aptitude test scores can sometimes result in less recess time so they can shoehorn in more instructional time. In some school districts, students have to travel more than an hour each way every day just to ride the bus to school (source). That takes away two hours students can use for playtime five days a week. Extracurriculars, like sports and various clubs, are more competitive than ever before and require extra practice if those students want to achieve at high levels. After-school programs have been implemented at many schools to help latch-key children and those who are struggling with their homework. 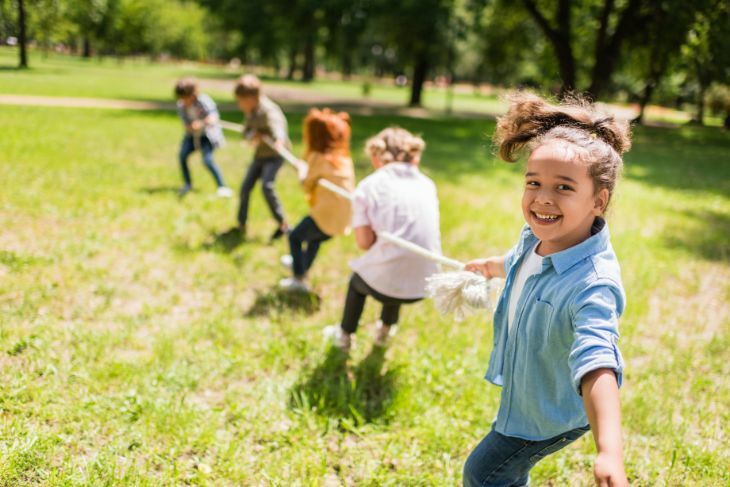 Some research has even shown that children are spending as little as 4 hours a week playing outdoors as a result of technology and an increased school workload burden (source). But by shortchanging playtime, kids miss out on emotional, social, physical, and cognitive benefits. When they play, a child is working on their neurological development (source). Solo play time is important to help a child explore their imagination, but playtime with other kids is equally important too. And when a child plays with other kids, they get a number of benefits and learn valuable skills they wouldn’t learn without that unstructured time, like socialization and conflict resolution. Lack of playtime can also lead to negative consequences like anxiety and a constant feeling of being uptight (source). Anxiety and depression has been on the climb in recent decades and has severely impacted the happiness of kids and has been noted as a reason for violence against others. Playtime can make for a well-rounded kid. Here are the top 10 benefits of penciling in enough play for your child. When children have time to play, they have time to imagine and create. Whether they are making mud pies in their backyard or exploring the limits of their physical capabilities by testing out cartwheels, they are developing their creativity. Where would humanity be if we didn’t have the creativity of people like Thomas Edison, Mark Twain, or other people who helped shape our world? By participating in pretend play as well as other forms, children, especially those in preschool, can really improve their ability to speak and their understanding of the words they’re saying. Being around other kids during play can also help with their vocabulary and language — kids love to learn new words and phrases from each other. Even if you don’t care as much as about making your child as smart as they can be, you should care about their overall happiness. And for many children, playtime results in a happier kid. They’ll feel real joy getting to pursue their favorite form of playtime, checking out new toys, or having a friend over for some backyard hijinks. Happiness shouldn’t be underrated. It’s one of the greatest gifts of a well-balanced childhood. And for some, those feelings of happiness can be hard to hang onto throughout their lives if they don’t have a good basis for it now. Kids will have a lot to deal with as they get older. There will be peer pressure, romance drama, friendship issues, and stress over grades. Playtime can help them learn how to rebalance the stress in their lives and cope with the daily pressures they’ll face. It’s a lesson and a skill that will serve them well throughout their life — finding healthy and constructive ways to deal with stress. Playing will give your child more physical activity than they would get otherwise. All those movements they’ll experience while playing will make them stronger and give them more endurance and greater motor skill development. Getting more physical activity will help your child sleep better at night too. And you’ll be able to sleep better as well. Play can help improve a child’s social skills, especially when they are playing near other children or playing with them. It gives them a fun, non-judgmental space in which they can learn the give and take that relationships require. Just being around other children, even if they aren’t directly interacting with them can benefit them. Tackling challenges and succeeding can make your child feel like a rock star. No feat is too big or too little to be celebrated to them. Whether it’s learning how to do a handstand in the pool or getting across the monkey bars at the playground, taking a risk and eventually accomplishing what they set out to do is a confidence booster. While physical challenges can build confidence, children can also gain confidence by developing their imaginations or learning conflict resolution skills (source). They’ll know that no matter what the challenge is, they have the ability to rise to the occasion to face it head-on. Whether kids are happy, sad, or scared, having some playtime can help them let out those emotions. They can take out their anger in an imaginative setting which can give them a great release that will make them feel better when they’re done playing. Playtime can help children of all ages deal with what they are feeling. It’s a great way for children to learn to tap into everything they are thinking and feeling and find a constructive way to deal with it. Part of the fun of play for kids is getting a chance to pursue whatever it is that interests them. What they do during that playtime is totally up to them — if they want to sing into their hairbrush and pretend they’re a rock star, or act like they’re an astronaut getting ready to head into space. Playtime can give them a safe place to explore all their interests. Some may become lifelong interests while some will fall by the wayside. Like everything else in life, play comes in different stages. How your child plays will change, depending upon their age. This type of play is what children do from the ages of birth to three months. It may not look like play to the outside observer. It may look like movements that serve no purpose, but those movements are considered a type of play and they will help your child with their later types of play (source). This kind of play can be as simple as kicking their legs or studying their feet. Solitary play happens from birth to two years old — it is really popular with toddlers. As the name implies, solitary play is something a child does by itself. It’s a great method of play for shy kids and it’s perfect for their still undeveloped communication ability. This type of play is crucial because it helps your child learn how to entertain itself, which is an important skill to learn. You don’t want to have a child that needs to be constantly entertained by things or other people — you want them to be able to do that for themselves. This kind of play begins around the age of 2, although it can be done long after that too. In this type of play, a child watches other children play without participating. It’s a way of observing what happens and for them to learn by watching the others. Sometimes the kids might ask questions and they’ll definitely be interested in what’s happening, but they won’t take any initiative to join the fun. Parents can sometimes feel a little uncomfortable when they see this, thinking there is something wrong with their child, but it’s a completely normal phase of development. Children who aren’t social enough yet to join in with the fun with other kids can benefit from onlooker play. It can give them the confidence to take their play to the next level with other kids involved. Parallel play typically begins somewhere around the age of two years and can last much longer. It’s when two or more children are in the same room playing in close proximity, but not necessarily with each other. Rather, it’s more of an imitation — while they are playing separately they do notice each other and might even mirror the other’s actions. It gives children a good way to learn about manners, taking turns, and being a good playmate. And it shows that a child is starting to want to hang out with other children. From three to four years old, associate play is another key type of play children will experience. In some ways, this type of play is similar to parallel play because children will also be playing separately. What’s different is that while they are playing separately they are involved with each other too, working toward a common goal. They’ll be working on their own tasks while they talk and socialize with one another. It’s one of the ways that children first learn how to form and keep friendships. 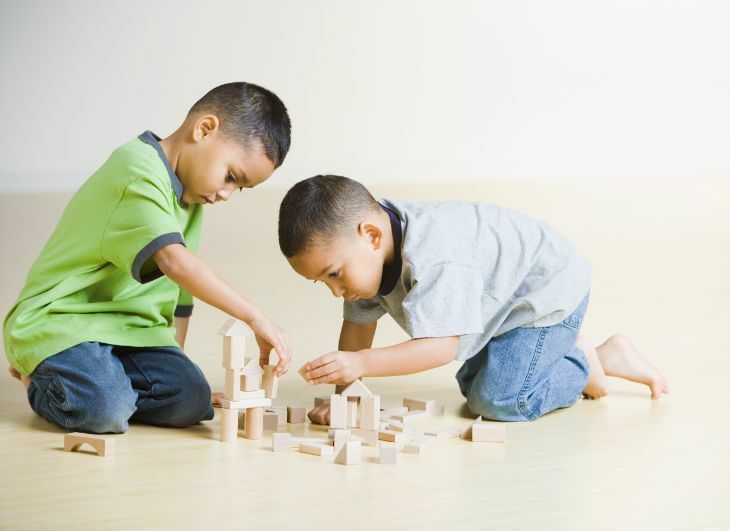 Cooperative play is what kids who are generally four or more years old will engage in. This is kind of a mash-up of all the stages. It’s where everything they’ve learned from all the other stages of play come together. This is when they start to share toys and come up with rules for their organized play. You’ll see your child start to make real friends and they’ll have favorite playmates as well in preschool and kindergarten. Toys are a mixed bag of nuts when it comes to children. Some can provide the stimulation they need, while others are disruptive developmentally. So how can a well-meaning parent know the difference between a helpful toy and one that might be detrimental? In an effort to give their child every advantage by picking the most expensive and flashy toys on the market, like ones that light up or talk to children, parents might be making the wrong choice. Some research shows that when toys do the talking and the singing, babies are quieter (source). 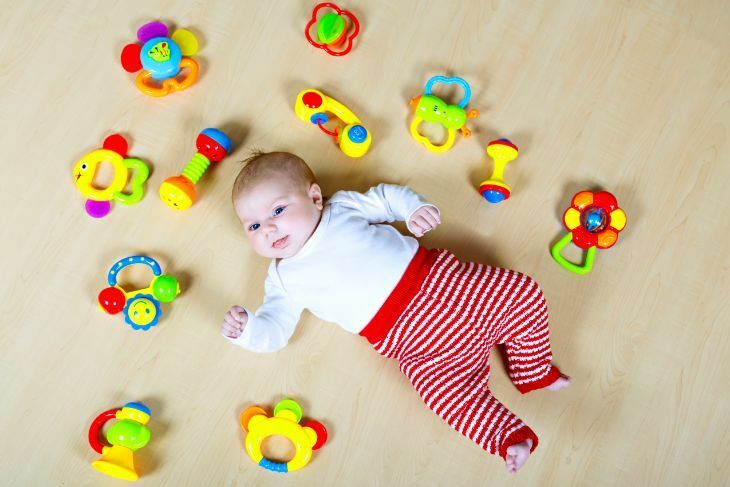 Instead of working on their language development, babies tend not to chatter as much when they are using electronic toys instead of old school ones. What parents need to keep in mind is that play and entertainment are two different things when it comes to toys. Entertaining toys are meant to be amusing and keep a child occupied by distraction — they’ll have things like lights, voices, or music that will turn children into an observer. But play toys are meant to engage a child’s mind and curiosity, which is why they are a better choice. They don’t come with rules that limit a child’s imagination. When you’re searching for a toy for your young child, you need to think strategically about what you’re after. It gets really confusing in toy stores because there is so much to choose from. You aren’t quite sure which toys to go for. Here are some guidelines to help you with your search. Find a multi-tasking toy: Young children like to use toys in multiple ways. That’s why toys like blocks are such a good choice. They can build so many different structures and they’ll incite a child’s imagination as well. Find toys they can continue to use as they age: Some toys are only interesting for a very small window of time for a child. But after a couple weeks or so, they never get used again — they’re completely abandoned and forgotten. Some good choices of toys that can grow with your child include dollhouses, trains, stuffed animals, and action figures (source). Look for toys that require problem-solving and exploration: Kids like to figure things out on their own. It’s good for their brains and it gives them a sense of accomplishment. Toys in this category include puzzles, clay, and nesting cups. Toys that challenge your child’s imagination: As a young child, your toddler will have a ton of creativity you don’t want them to waste. To encourage that, find toys that can help your child nurture that creativity, like dress-up clothes, play kitchen items, stuffed animals, and dolls. Find toys that will get your child moving: An important part of play is getting your child to be active. It will boost their brain power and strengthen their bodies. Tricycles, toy gardening tools, and mini basketball hoops are good choices for this category. Look for toys that can involve more than one generation: Playing with grandparents or parents is good for children. If they play things like board games with them, they will learn about taking turns and how to listen. Plus, the older generations can model how to lose gracefully, which is a skill that will serve your child well throughout their life. One of the biggest dangers to your child’s playtime is the possibility of them being sucked into too much screen time. Screen time — time spent on television, gaming systems, tablets, and phones — takes away from their playtime. Try to limit your child to as little screen time as possible throughout the day to ensure they have enough time to play and develop as they should. If you want to learn more about the different categories of play, the benefits of them, and tips for implementing each kind of play, read on. With this type of play, children utilize their five senses to learn about the world and whatever they are doing at the moment. Sensory play is instinctive for children, even babies. When you see a baby putting their fingers in their mouth or picking up something to look at it and feel the texture, that’s sensory play. This type of play involves any activity that involves sight, hearing, touch, smell, or taste. It encourages investigation and exploration, allowing children to come up with their own conclusions about the world around them. It builds nerve connections within their brain. It builds up language skills. It is a way for them to learn how to problem solve. It’s fun for your child. When your child is exploring sensory play there are some things you need to know. 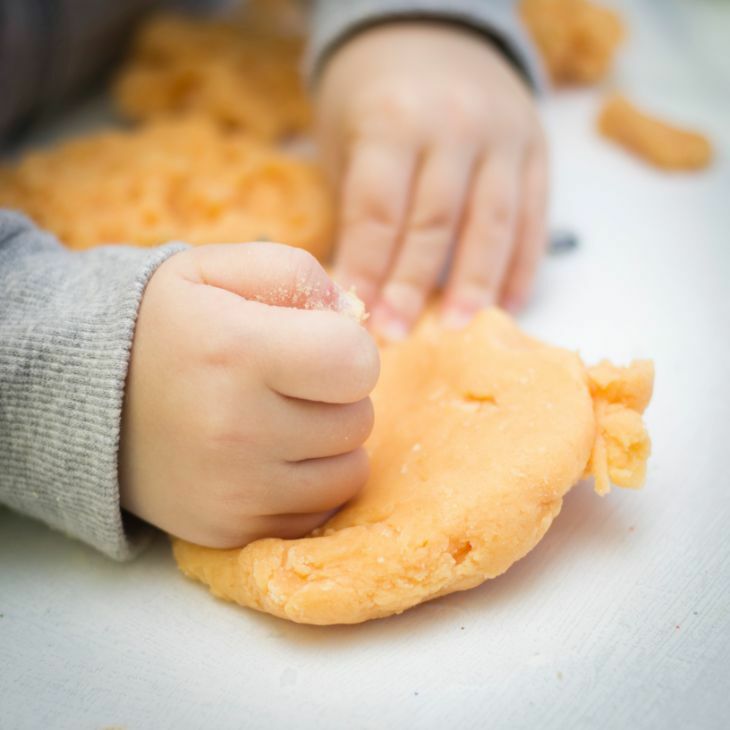 Watch your child: Since part of sensory play involves a child exploring with their mouth, you need to watch them carefully to ensure there are no choking hazards. You should make sure to supervise sensory play. Make a sensory bin: For preschoolers, you can create sensory bins to keep them engaged. This can be done with a plastic box, a bag of dry rice, and some play toys like scoops. Take it outside: If your child’s sensory play involves water or things like finger paint, you might want to contain the mess by taking the activities outside. Otherwise, you’ll find yourself watching your child play while calculating in your mind how long the clean up will take you. Make sure to pick objects that are safe for your child: If your youngster is still putting things in their mouth, you should be leery of letting them play with inedible objects (source). Wear old clothes: Since sensory play can get a bit messy, you should put your child in clothes you don’t care about, and you should wear clothes you don’t care about either. That way, if you get dragged into the playtime, you won’t be ruining either of your clothes. Here are some ideas to get you started with your child’s sensory play. Stuck in the mud: With this activity, you can make oobleck, which is a mixture from cornstarch and water. Once you mix this up, you can put farm animal figures in it, or any other figures you have. Hot chocolate cloud dough: Cloud dough is unique stuff — it feels powdery but can be pressed enough to make shapes. If you use vegetable oil, it’s edible too. Glitter finger paint: You might be wondering how glitter finger paint can be a sensory taste experience — it’s easy if you use edible glitter. Cool Whip sensory play: This sensory play option uses kid-friendly Cool Whip to give them a fun, learning experience. 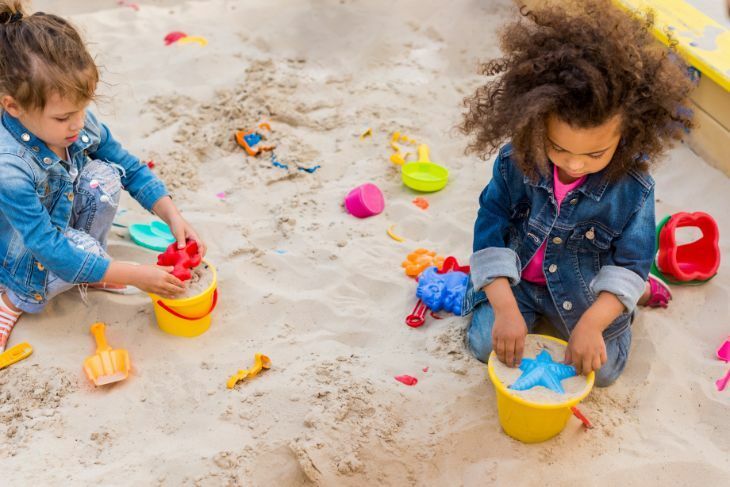 Play sand: If your child likes sandy days at the beach, introduce this edible play sand that is great for toddlers and older children. Sound Treasure Basket: This activity is great for babies. You simply fill a basket with a lot of items your baby can shake around or bang on to make noise. Bell obstacle course: You can set up a simple obstacle course that uses bells to reward your kids for their efforts. Sensory jar: Fill a jar with some type of material, like buttons, that will make sound when your child shakes it. Velcro station: You can take a strip of Velcro and put fabric shapes on it for your baby to rip off. They’ll love hearing that noise created by the fabrics separating. The sounds of spaghetti: Spaghetti noodles makes a slimy, squishy noise your baby will be drawn to. Make up a batch, let it cool, and allow your child to stick their feet and hands in it and squish away. Scented sensory soup: You can scent this with any extract, which is safe for small kids. There will be enough surprises and smells to keep your child entertained. Lavender rice: The smell of lavender is relaxing, so this rice will be a good activity before bed for your child. Rainstick sensory bottle: With your favorite essential oil and a few other common ingredients you can make a scented sensory bottle you’re sure to enjoy. Scented homemade play dough: Kids love play dough but the smell of the commercial kind isn’t exactly pleasant. This one smells much better. Scented ice lab: This sensory play only require ice and seasonings, juices, and spices. Frozen dinosaur eggs: By filling up a balloon with water and a mini dinosaur, your child will be fascinated. All you do is peel off the balloon once it is frozen. Jungle slime: Slime has become a popular plaything for kids and they’ll especially love this jungle slime. Bubble bin: Kids love bubbles and how they feel against their skin. This sensory idea combines their love of bubbles with their love of kitchen utensils. Tissue paper bag: The crinkly feel of tissue paper makes this bag an instant winner with children. A water tray: Grab a tray, put some water on it, and add a little coloring if you want with concord grape juice or cranberry juice. Throw a couple of smaller balls on the tray and you have a fun activity for your child. Sensory gel bag: This bag will keep all this gel on the inside so you won’t be cleaning up a mess. But at the same time it will be fun for your child to look at. Rainbow chickpeas: The colorful chickpeas in this sensory bin will be a feast for your child’s eyes. Your child will be drawn to the beautiful colors. Water bead window bag: This window bag uses sunlight to illuminate the beads and really make them stand out in your child’s eyes. Mermaid fabric sensory board: Your child will love this mermaid fabric board with its rich fabric and eye-catching sparkles. The memory tray: To keep your child in the moment while playing, set five or ten things on a tray and give them time to study it. See how many items they can recall when you take the tray away. Kids of all ages love to pretend at school, at home, and pretty much anywhere else they go. Pretend play has two main components. With fantasy play, your child won’t stay in character and they’ll keep updating you about what kind of pretense they’re keeping up. It often begins around age 2 and seems to reach its peak when a child is in preschool. With sociodramatic play, a child is fully invested in the role it is playing. If your daughter, for instance, is pretending she’s a princess, she’s going to give it her all. For this type, your child will often base their storylines from things they’ve seen on their favorite tv shows or fairy tales. Both these styles of pretend play help your child. Let’s look at why they’re so great. 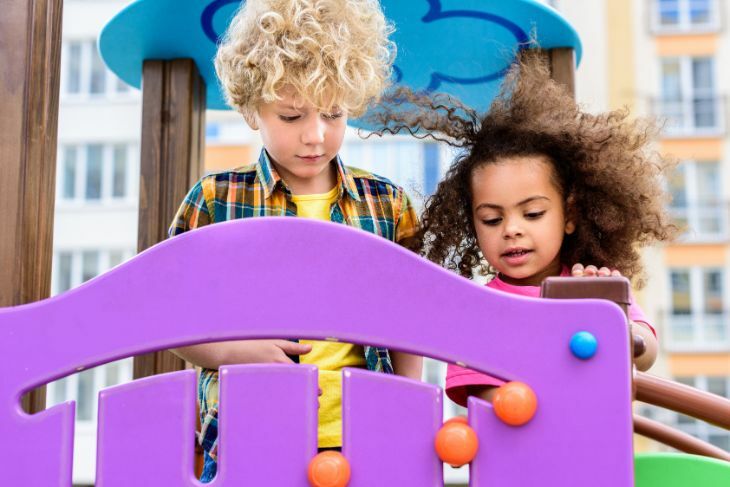 Social skills: Pretend play will help with social skills in many ways, from playing with other children to realizing how it feels to be one of the characters they’re pretending to be. Inclusiveness: By creating roles for others in their stories, children are learning that including others and playing with them is a good thing. Emotional maturity: Role playing can teach a person a lot about emotions and that’s a lesson children will carry with them for life. It also helps teach them how to express emotions. Cognitive development: Children can learn about how the world works from pretend play. It helps them draw logical conclusions. A tea party: Preschool-aged children will love throwing a tea party with you. Just set out a toy tea set and get started. Let your child take the lead, pouring you tea. You can set up extra chairs for their stuffed animals or dolls too. Be a vet: Does your child loved stuff animals? If so, set up their play time so it is compatible with their interests. Get out their stuffed animals and a toy doctor set. Tell your child your animals need to see the doctor. Any child over the age of 2 will love pretending to fix up their child. Pretend to be a dog: This is a favorite game with toddlers and even preschoolers. Both you and your child can get down on all fours, bark, and chase each other around while crawling. Kids are naturally drawn to animals and dogs are often a favorite. Go in a laundry basket sailboat: This idea will appeal to toddlers but will still be fun even for early school-aged kids. You can decorate your laundry basket to look like a ship, even creating a flag for your boat if you want out of cardboard. Once the boat is ready your child can step in and set sail as you push them all over the floor. Set up a library: If your preschooler loves books, let them become a librarian. Set up some shelves of books at home and give them a fake stamping pad they can use to check out books for you to read to them. Or let them do storyhour for you by letting them take the lead on trying to “read” a book to you. Constructive play is when kids try to use materials and toys around them to build and create things. This kind of play really seems to kick in around the age of 2 as your child’s attention span becomes longer. They have enough concentration to play with one type of toy longer than they ever have. It can help with abstract thinking skills (source). It allows a child better understanding about the world around them. It can give them practice honing their fine motor skills. It can help get your child ready for future developmental milestones. It can give them confidence in their skills and ability to figure things out. It helps them develop a vision — they have to look at their materials and figure out what designs would work with what they have. Perseverance when their construction ideas don’t pan out the way they think they should. Putting together a train track. Stacking cups or anything else. Making a fort out of blankets. Taking things apart and trying to put them back together. Making small dams in the mud. Making a craft out of mosaic tiles. Making things out of playdough or clay. If your child has become too dependent on screen time or would rather focus on other types of play, you might need to encourage them to pursue building and constructing time. Here are a few ways to persuade them to stretch their wings and give it a try, or give them enough materials so they can construct all they want. Do it with them: The best way to get a child interested in doing something is to join in with them. They’ll love spending time with you and having your attention all to themselves. Teach them a new skill: If your child doesn’t know how to sew, knit, or weave, teach them how to do it. Learning a new skill can be enough to spark their interest in constructing things. 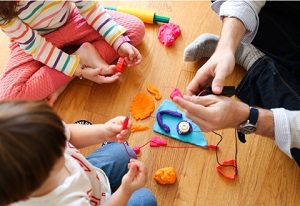 Get others involved: Set up a playdate with some of your child’s friends and get them started on a project together. For some kids, the social aspect of trying to build something as a team will really draw them in. Give them more materials: Instead of just handing them a lump of clay, you can spark their imagination and urge to build by adding accessories like buttons, yarn, beads, and other materials. They’ll have more fun as they make their creation and it will spark their imagination. Expand their tools as they age: As your child becomes more advanced at construction, make sure to upgrade their tools so they can take their creations to the next level. If they are into woodworking for instance, add more sophisticated equipment as they become less challenged by what they already have. Physical play is an important aspect of your kid’s childhood and development. Physical play is what your child does as they get up and move around while playing a game, learning a new skill, or exploring. Physical play can begin at any age. Even babies can do a mild form of physical play — tummy time, which helps strengthen their muscles. After that, babies, toddlers, preschoolers, and school-age children all can participate in and benefit from physical play. One of the biggest benefits is fighting childhood obesity, which still runs rampant in our society. It can help kids deal with emotions as well by giving them a physical outlet for them. They’ll get a feeling of accomplishment when they are able to do something they never thought they would be able to achieve, such as mastering the monkey bars at the playground. They’ll gain physical strength and improve their motor skills. It also helps them learn how to assess risk — they’ll realize what could happen to them if they jump off the swings while it’s still going, for instance. Their overall health will be improved — they’ll strengthen their hearts and reduce their chance of diabetes. 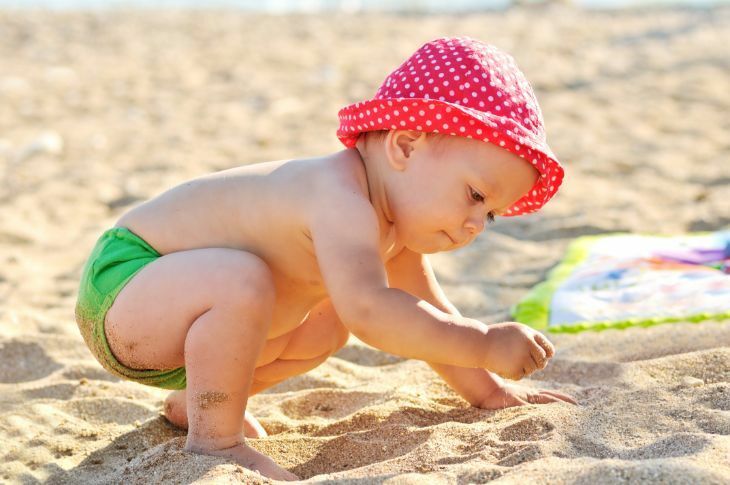 Moving like different animals: Whether your toddler is hopping like a frog or crab walking around your house, they’ll be working their bodies and having fun by engaging their minds. You can participate by doing it with them or giving them new animals to try to imitate. Balloons: Hitting around a balloon can entertain kids for hours. Toddlers can do it, but it remains fun for kids for years after that. You can make a game out of it by seeing how long you can keep the balloon in the air without letting it touch the ground. Make an obstacle course: Kids like to challenge themselves in fun ways, and what’s more fun than a backyard or indoor obstacle course? You can make a simple course for your toddler and add more challenges for older kids. Make them crawl, jump, climb, run, and balance. Hula hooping: Hula hooping is a cool combination — it seems like you’re playing a game, but it’s actually great exercise. This is too advanced for toddlers and even some preschoolers. But once they are in school, you and your child can have backyard hula hooping competitions. Have a dance party: You can put on your favorite music and dance like nobody is watching with children of any age. Babies love to dance and toddlers will get into it too. Take turns putting on music you’ll both enjoy. Get a plastic bat and wiffle ball: Let your child feel like a Major Leaguer by throwing some pitches to them and letting them learn how to bat. Little bats are available so your toddler can get into the fun. Play hide and seek: This can be done inside on a rainy day or in your backyard so they can get some outside time. This is fun for toddlers as well as older kids. Teach your child how to jump rope: This activity isn’t as popular as it once was, but it is some of the best exercise out there. You can show your child how to jump rope with a small rope or find a partner to help twirl a bigger rope and show them more advanced moves. With creative play, your child does anything that sparks their imagination. This kind of play should be fun. This kind of play is a favorite of toddlers and preschool-aged children. It can help children heal from difficult situations and traumas they’ve been through. It’s great for unlocking their hidden talents. It can be great for their ego. It can help with their social skills. It can increase your child’s cognitive skills (source). This kind of play helps hone motor skills. Acting like a rock star: Let your child of any age unleash their inner performer by putting on their favorite song, dancing around, and singing into their hairbrush. Let them make music: Whether they are banging on a makeshift drum with a wooden spoon or blowing on a toy harmonica, kids love to make music. Exploring their love of music is great for all age groups. Play dress up: Let your child choose which careers they would like to explore by dressing up and acting out the part. Whether they are pretending to be a doctor, a gardener, or a shopkeeper, they’ll have a blast. This kind of activity is fun for toddlers through elementary students. Reading: Picture books can help your child think creatively. Even though your toddler or preschooler won’t be able to read, you can ask them to tell you the story. You’ll both have fun listening to what they come up with. Baking: Baking is a great way for kids to test their creativity. They can follow instructions to make cupcakes and then decorate them in any fashion they want. Even toddlers can help with the decorations or pouring pre-measured ingredients into the mixing bowl. 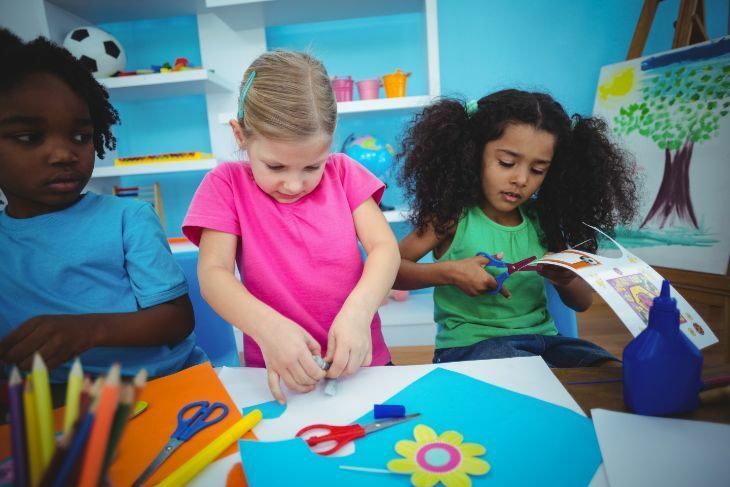 Cutting and pasting: Preschoolers and toddlers can use safety scissors to cut out shapes from old magazines and paste them onto pieces of paper. You’ll get a kick out of seeing what interests them when you take a look at their final products. And they’ll like showing off their handiwork. Gardening: Children of all ages are attracted to things that get their hands dirty, and the idea of growing their own food appeals to them. Because children like to see quick results for their efforts, it’s best to choose plants that tend to grow quickly. You might also want a good mix of plants that grow underground, like carrots, and plants that grow above ground, like tomatoes. Electro Dough Plus by TechWillSaveUs is a unique and brilliant toy which allows kids to make dough creations that buzz and light up! It inspires creativity and imagination, while also encouraging constructive and sensory learning. 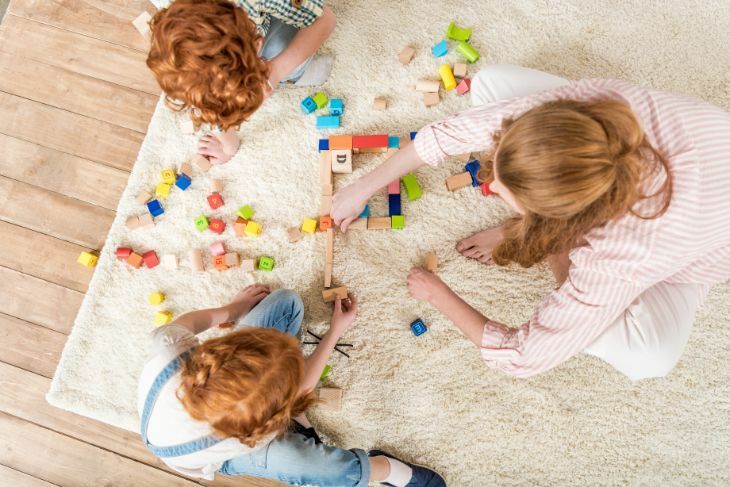 Now that you know why playtime is important for your child and the benefits they can reap from it, you’ll be more motivated to make sure they are getting all the time they need. Remember to give your child a variety of options when it comes to play and provide more challenges as they are ready for them. Are you a seasoned parent who has been through all these stages of play with your child? What were some of your child’s favorite activities? If you know a new mama who can benefit from this article, please share it with her! As moms, we need to look out for each other and build each other up. I really love this article. I think so many parents get busy planning out their child’s future and wanting what is best for them that they don’t stop to consider that playtime is pretty important too. And not just playdates but unstructured playtime. It was suggested to me that my daughter go to kindergarten a year early, but I thought why rush her? Let her play! Hey Scarlet! We certainly agree! Playtime is so important! How old is your daughter now?